Publish embedded and self-hosted clips using the original WP video theme. The modern and sidebarless design of the fully responsive and adaptive Rich Video Theme is the perfect choice for your WordPress based video site. The theme offers an intelligent way to display a large number of posts that will immediately attract your visitors' attention right on the front page. The optional featured posts section lets you highlight your best content, while the carefully placed widgetized areas are perfect for displaying revenue generating advertising. Using the right plugin, video thumbnails from YouTube, Vimeo & Co. can automatically be generated and set as featured images. The “Rich Video” theme by RichWP has been voted the #1 choice for WordPress based video sites. If you want to build a movie, flicks or video site, the Rich Video theme can power your site for years to come. How can you choose the right WordPress video theme for your ambitions? The following is general advice about how to choose a good WP theme, but is especially relevant for choosing the right video WordPress theme. Let’s divide the theme market into two sections. First are the professional themes. These are lean themes without many customization options. They do their job and fulfill their purpose in a professional manner. While you will be able to upload a logo and change the lead colors, there are no build-in designs or page builders. Extra functionality like video view counters or social sharing buttons are added via plugins. Second are large, sludgy multi-purpose builder themes. They promise everything, but due to complexity and frequent feature creep there is a learning curve in how to use them; the end results are usually slow and sluggish, and you will have to deal with advance caching, CDN, and seed up methods just to get them to perform as well as the single purpose, professional themes mentioned above. The page builders often interfere with your content, and should you want to change themes down the road you will have to rework most parts or your content. This is not a full proof way of building a site and it violates the first principle of every CMS (content management system, WordPress in this case): design and content should always be separated. Needless to say, the Rich Video theme belongs in the professional video theme section. It will efficiently present your embedded or self-hosted videos. Nothing will interfere with your content. You will not be “vendor-locked” and can be assured that your content will still be valid for years to come. Your site will also be fast. Speed is king, especially on mobile connections. Functionality like social content sharing or a post view counter shown in the theme demo are added using plugins. Once again, this separates the design (theme) from the content and functionality, and lets you transfer your view count to another theme, should you ever want to change. I am sure I have already convinced you that going with a well-designed, masterly programmed, lean and simple theme that exactly fits your purpose is the way to go. Instead of building your site twice, do it once and do it right. Why choose the Rich Video theme for your media empire? We take great pride in our minimal designs and masterly crafted CSS code that holds your site together, but gets out of the way to move your content into the focus of your visitors. This video WP theme is no different and your videos and movies will be the star of the site. Let it be in the presentation of thumbnails within the post listings, archives, or related post sections or the video itself within the content block. If you want more views, this theme has you covered. Besides the obvious technical fact that you should always choose a lean, fast performing, and well-built theme architecture, the Rich Video theme offers even more. The installation and setup of the theme is fairly easy. It is similar to the setup of standard themes that ship with WordPress. Just upload, activate, set up your menus and widgets, and you are good to go. Fine tune by uploading your logo and site-icon and changing the lead colors to make it truly your own. This theme is SEO / Search Engine Friendly. Besides traffic from social networks, search engine traffic leads to a lot of exposure for your site. The theme structure and underlying code is lean and highly optimized so that search engine bots can understand what they are looking at. Checking visitor statistics over the last few years shows a clear trend in increasing mobile traffic. In most cases, smart phone and tablet visitors outnumber the visitors using a desktop computer. The Rich Video theme was built using the so-called mobile first approach to enhance performance on these devices. This video theme flawlessly scales from small smart phone screens and tablets all the way to big desktop screens, always looking good. While in-video advertising might be one option to monetize your video site, traditional banner advertising and building an email subscriber list can also be very profitable. 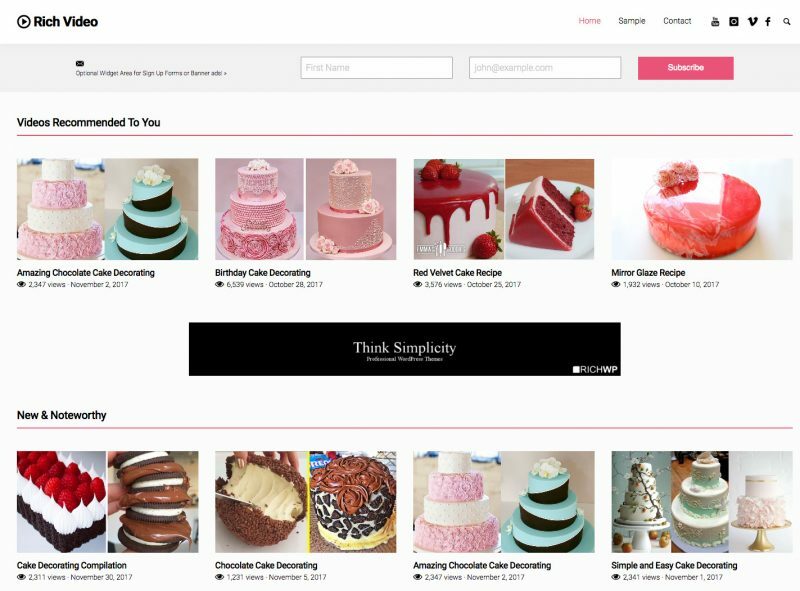 We have strategically sprinkled several widget areas throughout this design to be used to display advertising or email sign up forms as a way to maximize your profits. In case you have your own line of products to sell, WooCommerce has been deeply integrated in the Rich Video theme. Its professional checkout and payment integration methods are the industry standard when it comes to e-commerce capabilities. Should you ever need help setting up the Rich Video theme, simply contact us. Once you purchase this theme, you are eligible for premium one-on-one support with a fast turnaround. Installing the Rich Video Theme is as easy as it gets. Check the Installation & Setup Guide no need to break into a sweat. Get your site elevated with the Rich Video Theme today. Your success will be accelerated. It′s your turn to make headway!